InterCoastal Net Designs has just launched a brand new site for Holden Brothers Farm Market. If you are from the Brunswick County Area, chances are, at some point in time, you have purchased your produce at Holden Brothers. 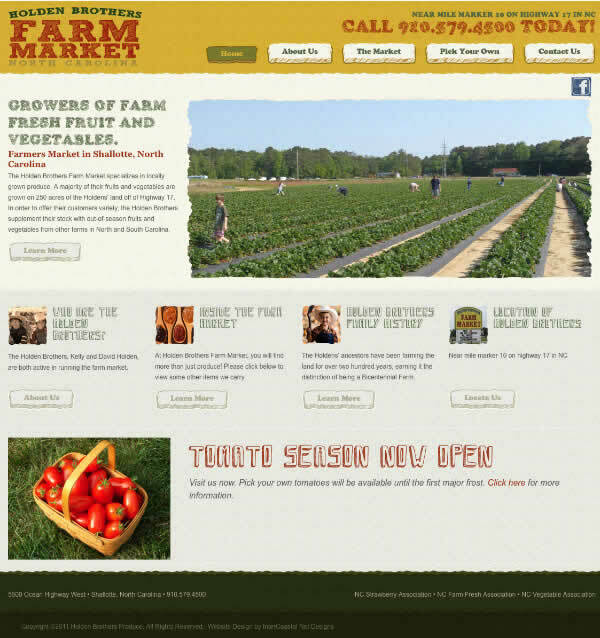 The new website for Holden Brothers, www.holdenbrothersfarmmarket.com has a fresh new design, created by our in house designer. This design is not only eye catching, but perfectly shows the personality of the Farm Market! We have developed an alert system for the Holden Brothers at the bottom of the website. They can turn this alert on and off, and change out the photo and text. It is to be used to notify customers when Strawberry Picking Season and Tomato Picking Season are occurring. This is an exciting feature for them, as well as customers who want to easily find out if it is the correct time of year to visit the Holden Brothers for Pick Your Own! We will also be working on the Holden Brothers search engine optimization to help them gain an online presence. The Holden Brothers Farm Market is a family business, which has been around for generations. They are a National Bicentennial farm, and a part of the NC Strawberry Association, NC Farm Fresh Association, and NC Vegetable Growers Association. Much of the produce sold at Holden Brothers is grown on their very own farms. In order to offer their customers variety, the Holden Brothers supplement their stock with out-of-season fruits and vegetables from other farms in North and South Carolina. They also offer much more than fruits and veggies — local honey, jams, pickles, salsas, cook books, boiled peanuts (yum!) and more! If you haven’t visited this Farm Market in Shallotte, NC please do so soon! Nothing can beat homegrown fruits and veggies, or the friendly faces of their staff. Next Next post: Does Google Give Mobile Sites More Credit?